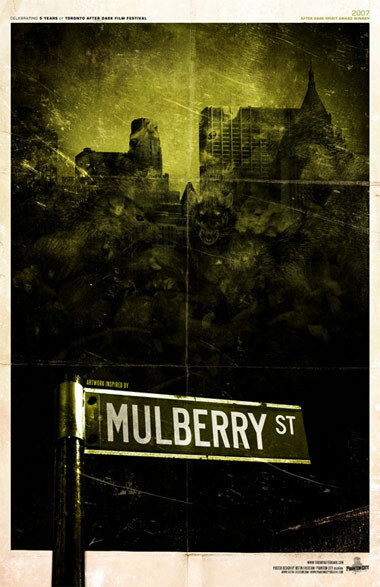 Tag line: "There's something below us worse than hell"
Mulberry Street is a 2006 horror film in which ordinary people are transformed into bloodthirsty rats. That's right, you read it correctly: Mulberry Street is a movie about human rats..."were-rats", if you will...and the only thing more astonishing than this ridiculous premise is how well the film actually works! Life's tough for the tenants of a New York apartment complex, where the rents are rising almost as quickly as the building's falling apart. Yet things are about to get a whole lot worse thanks to a quick-spreading virus, which is both carried and transmitted by the city's vast rat population. Those unlucky New Yorkers exposed to the illness mutate into uncontrollable creatures with an appetite for human flesh. Among the many dealing with this crisis is Clutch (Nick Damici), a former boxer whose daughter, Casey (Kim Blair), fresh out of the military, has just arrived back in town. Casey's trying desperately to make her way home to Clutch, but with the subways closed and the city in disarray, their father-daughter reunion may never come to pass. As I said, Mulberry Street is about an epidemic that changes people into rats, and as infectious diseases go, this is a nasty one. When Ross (Tim House), the building's maintenance man, is bitten on the arm by a rat, he doesn't so much as give the tiny wound a second thought. As the day wears on, however, he starts to feel poorly, and is sweating profusely. A few hours later, he notices hair growing out of the top of his ears, and by the time a tenant named Coco (Ron Brice) asks him to take a look at his shower, Ross is far from the man he once was, with a wild look in his eyes and an ever-growing desire to take a bite out of his neighbors. By nightfall, nearly all of Manhattan is in the same shape as Ross, forcing the authorities to seal off the island, and leaving those trapped inside to fend for themselves. Part of what makes Mulberry Street so intense is the time spent with its characters prior to the outbreak. In fact, the entire first half of the film is dedicated to their individual stories. Clutch is a good guy, one who goes out of his way to help his neighbors, including Kay (Bo Carre), a bartender he seems especially fond of. So it comes as no surprise when, later on, Clutch leaves the safety of his apartment to rescue Kay, who's trapped at work. Clutch's trek though the streets is harrowing enough, but its nothing compared to what awaits him when he finally gets to Kay's bar, which has been overrun by the infected. The various relationships explored early on bring an emotional weight to the chaos, and we find ourselves pulling for each and every member of this motley band of survivors, no matter how hopeless their chances are. 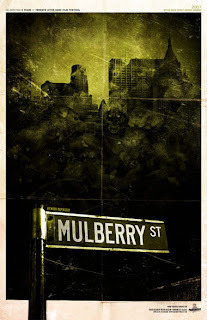 As dramatic as it is nerve-wracking, and as moving as it is terrifying, Mulberry Street proved a very pleasant surprise.